The Anchor Audio LIB-DP1-AIR-B Liberty Deluxe AIR Package 1 includes an LIB2-XU2 Liberty 2 portable PA system with Bluetooth, AIR transmitter, and dual-channel AnchorLink mic receiver, an LIB2-AIR portable wireless companion speaker, a WH-LINK wireless handheld microphone, a WB-LINK wireless bodypack transmitter, an LM-LINK lavalier microphone, an HBM-LINK headset microphone, and two SS-550 heavy-duty speaker stands. 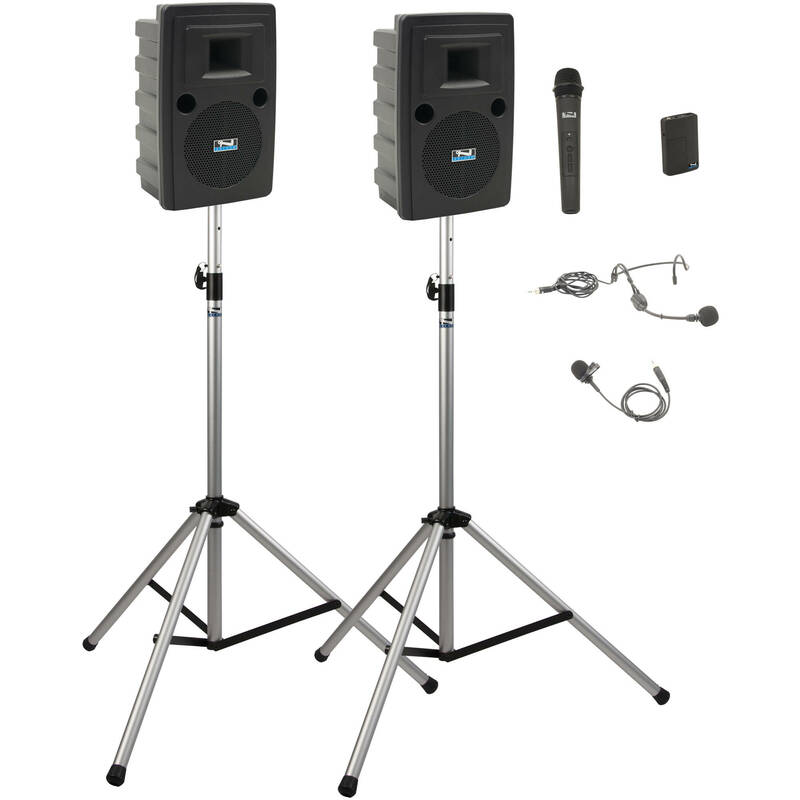 The system provides speakers with the flexibility of using a handheld mic for situations where the mic is passed around or only used for a short period, and the hands-free convenience of a wearable microphone, when presenting for large school functions, corporate training, fitness centers, houses of worship, and more. The Liberty 2 system brings the ease-of-use and reliability of the AnchorLink wireless technology, which operates on the 1.9 GHz frequency range to ensure a clear signal with reduced interference. The companion speaker wirelessly connects to the main speaker via the built-in AIR transmitter, and both speakers mount on the tripod stands to increase the range of your sound coverage. The Anchor Audio LIB2-XU2 is a Liberty 2 portable PA system with Bluetooth, an AIR wireless transmitter, and a dual wireless microphone receiver. With 125W of rated output power driving a 10" woofer and a ceramic compression driver to produce 117 dB SPL, it is designed to deliver versatile and powerful amplification for crowds of up to 1500 people in sports venues, educational facilities, and various indoor and outdoor events. The built-in Bluetooth receiver allows streaming of music from your smartphone, tablet, or laptop. Two XLR-1/4" combo jacks, a 1/4" line input, and a 3.5mm stereo mini jack provide connectivity for wired mics, instruments, line-level sources, and non-Bluetooth devices. Connect up to two wireless mics (available separately) via the included dual wireless microphone receiver. The balanced 1/4" output can be routed to another PA system or an audio recorder, while the 4-pole speakON output can power a Liberty 2 companion speaker (available separately). Integrated mixer functions include volume controls and 2-band equalization. The supplied AIR wireless transmitter enables cord-free connection to a compatible companion speaker. Power the Liberty 2 via AC power or the built-in rechargeable lithium-ion batteries, which offer approximately six to eight hours of operating time on a single charge. The integrated carry handle and pole mount simply physical setup of the system. Made in the USA, the Anchor Audio LIB2-AIR is a Liberty 2 wireless companion speaker designed to extend the coverage area of your Liberty 2 PA system. Able to handle 125W of power and produce 117 dB SPL through a 10" woofer and a ceramic compression driver, it delivers powerful amplification for crowds of up to 1500 people in sports venues, educational facilities, and various indoor and outdoor events. It features two modes, AIR for active operation with a wireless source, and Wired for passive operation with a wired source. A built-in AIR wireless receiver allows a cord-free signal connection from your Liberty 2 portable PA and offers adjustable volume and 2-band EQ for the wireless signal it receives. Its 4-pole Neutrik speakON input allows a direct connection from the speakON output of your Liberty 2 PA. The LIB2-AIR requires no power source in Wired mode, but can be powered via AC power or the built-in rechargeable batteries in AIR mode. The lithium-ion batteries provide approximately six to eight hours of operating time on a single charge. A 4-stage LED meter indicates battery and charging status. Gig-to-gig transport is made easy with the built-in carry handle, which also simplifies the process of hoisting the LIB2-AIR onto a speaker stand. The integrated pole mount ensures secure placement atop your speaker pole. The Anchor Audio WH-LINK is a classic wireless handheld microphone compatible with sound and PA systems equipped with AnchorLink Series receivers. The mic operates in the less-populated 1.9 GHz frequency range with automatic frequency hopping to deliver a clear signal with reduced interference, at a range of up to 300'. Pairing the WH-LINK to your sound system is a quick and easy one-time operation done by pressing just two buttons, and doesn't have to be repeated every time you turn on your system. The WH-LINK features volume and mute buttons which enable you to conveniently mute and adjust the volume of the microphone without having to go to your speaker. The mic can operate up to eight hours on two AA batteries. The Anchor Audio WB-LINK is a wireless bodypack transmitter compatible with sound and PA systems equipped with AnchorLink Series receivers. It operates in the less-populated 1.9 GHz frequency range with automatic frequency hopping to deliver a clear signal with reduced interference, at a range up to 300'. Pairing the WB-LINK to your sound system is a quick and easy one-time operation done by pressing just two buttons, and doesn't have to be repeated every time you turn on your system. The unit is equipped with a 3.5mm input connector and accepts AnchorLink Series lavalier, headset, earset, and collar mics. The WB-LINK features volume and mute buttons, which enable you to conveniently mute and adjust the volume of your microphone without having to go to your speaker. The transmitter can operate up to eight hours on two AA batteries. Ideal for speakers who prefer the hands-free convenience of a wearable microphone, the Anchor Audio LM-LINK is a lavalier mic with a 3.5mm connector for use with the AnchorLink Series WB-LINK bodypack transmitter. It features a cardioid polar pattern designed to minimize unwanted feedback when using the mic near a speaker. The LM-LINK ships with a clip and a foam windscreen. Ideal for speakers who prefer the hands-free convenience of a wearable microphone, the Anchor Audio HBM-LINK is a headset mic with a 3.5mm connector for use with the AnchorLink Series WB-LINK bodypack transmitter. It features a cardioid polar pattern designed to minimize unwanted feedback when using the mic near a speaker. The Anchor SS-550 is a Heavy-Duty Speaker Stand for use with Explorer and Xtreme Sound Systems. Box Dimensions (LxWxH) 24.0 x 16.0 x 14.0"
Box Dimensions (LxWxH) 10.45 x 3.15 x 2.3"
Box Dimensions (LxWxH) 5.7 x 4.0 x 1.3"
Box Dimensions (LxWxH) 4.2 x 2.95 x 2.5"
Box Dimensions (LxWxH) 7.1 x 6.0 x 2.3"
Box Dimensions (LxWxH) 43.2 x 6.0 x 6.0"